We’re committed to offering you flexible services at highly competitive prices. But our dedication to service goes much further. That’s because we really do understand the pressures you’re under, and put that understanding right at the heart of our business. As a result, many of the customers we’ve attracted over the years are still with us today. We’re here 365/24/7, keeping our customers agile for 15 years. Why not see what we can do for you? Designed with you in mind, our tracking system C4Sight™ gives you the perfect point to point vision of your consignment. 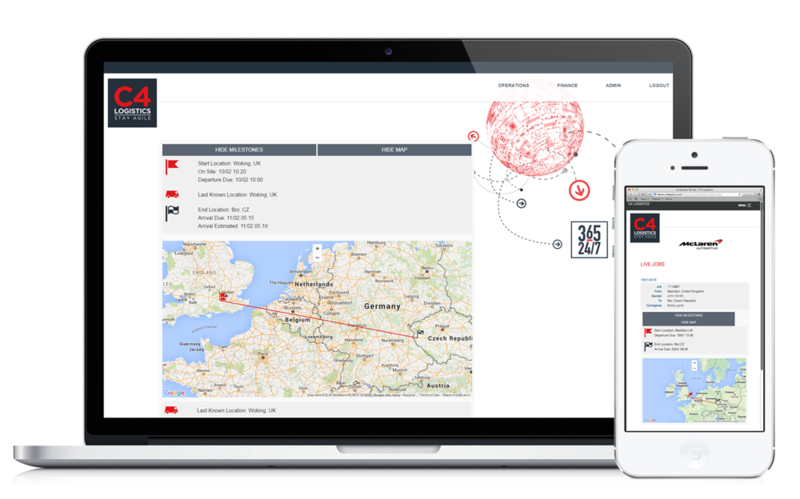 C4Sight™ combines all the precision of geolocation with big data analysis to deliver total transparency logistics. With C4Sight™ at your fingertips, you have the power to take the efficiency of your logistics to the next level and meet ever-demanding KPIs. Full oversight of your shipment’s journey from collection to delivery. Easy access to all shipments past and present. The essential management tool – book your next shipment, manage finances, track your KPIs and download reports. C4Sight™ means always being connected to your consignment – and always in control. Peace of mind has never been so accessible. Available through our C4Sight™ customer portal or download our mobile app for Apple IOS and Android. C4 Logistics are experts in time critical delivery services across the globe. We are the operator of choice for a wide range of customers and are specialists in the automotive, aerospace, engineering, and pharmaceutical sectors. Founded in 2001 in the UK, C4 logistics is now a truly trans-European operator with one clear focus – to help our customers stay agile. To achieve this we have invested heavily in the latest technology, and a dedicated multi-lingual team, to ensure that your consignment will get where it needs to be, when it needs to be there – at a price that’s right for you. C4 Logistics are never more than an hour away from our customers – 365/24/7.